Workspaces are aiming to get more creative day-by- day to provide their employees with higher satisfaction in life. The most creative office interiors are supposedly the most positive and productive ones. 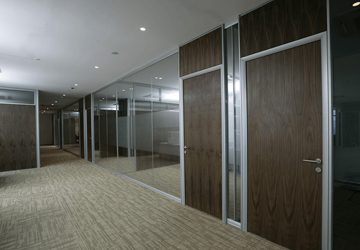 Glass partitions offer an elegant and sleek look which is desired in most of the contemporary offices today. It is not only pleasing to the eye, but also introduces a lot of light into a rather dull environment. They literally transform the layout of the office making it seem open and compartmentalized at the same time serving dual benefits at one go. They eliminate unsightly junctions and vertical posts seen in other types of partitions. They can be installed as your personal preferences be it straight lines, curly curves or facets. The partitions bonded together with silicone joints give out the most seamless finish possible. They include a wide variety of fittings and fixtures depending on the specific requirements by the consumer and the available space. There are several popular workspaces as the most creative workspaces Mumbai. They utilize the glass partitions in the trendiest way possible to attract potential employees towards the free- working environment. These glass partitions are demountable and hence are more flexible to and rearrange. EVOSLIM demountable partition system is an ideal choice if you are looking for a slim line partitions systems for your office space. The system comes with an anodized extruded aluminum slim section of size 33 x 50 mm mounted on the floor and ceiling. It can receive glasses of varied thicknesses from 10 mm with either clear OR laminated glass with 0.76/ 1.52 mm soundproofing PVB interlayer film. This single glazed partition is available with framed glazed or solid door. It comes with leveling mechanism for adjusting floor undulation up to 10 mm. 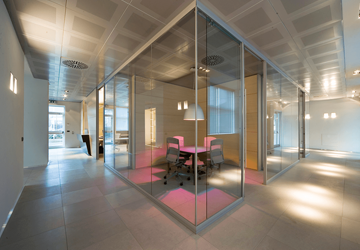 The partition offers sound insulation up to 32 db depending on the thickness of glass.